The registration fee will include a breakfast, full lunch, morning and afternoon refreshments, access to all networking receptions, WiFi and access to a business center. *Press Policy: The event is closed to Press. * Small Business: DSI Strives to create forums that are of benefit to the entire Defense Community. 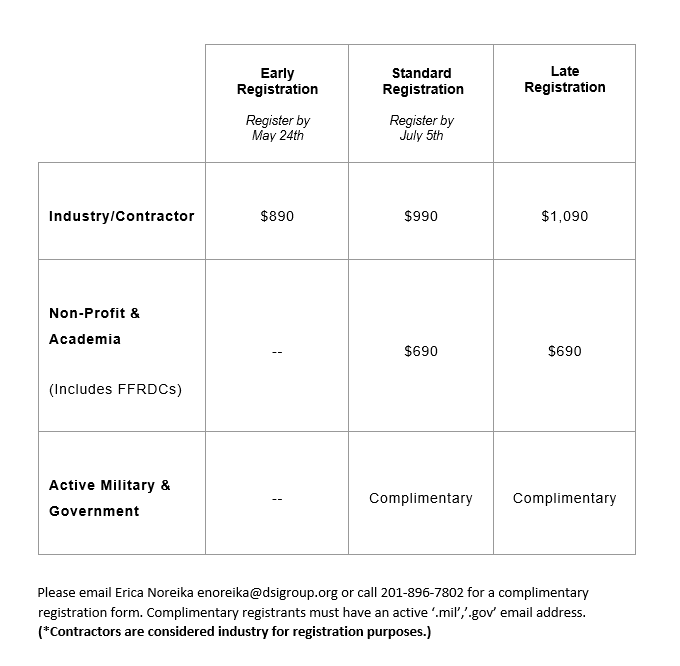 If your organization cannot attend based solely on budget concerns, please call us at (201) 896-7802 or email Erica Noreika at enoreika@dsigroup.org, we may be able to provide you with a discounted rate depending on the circumstances of the request. The registration fee will include a light continental breakfast each day, full lunches, and mid-morning and afternoon breaks and refreshments, and access to all networking receptions. The registration fee will also cover the cost of attending the conference and sessions, professional conference planning services including hotel facility and staff support, registration services and event advertising. For a full refund, cancellations must be received in writing no later than 20 working days from the start of the first day of the event after which you will be held liable for 100% of the amount due. To cancel your registration, email customerservice@dsigroup.org. You may also send someone (not already registered) in your place if you are unable to attend. Please see below for substitution information.